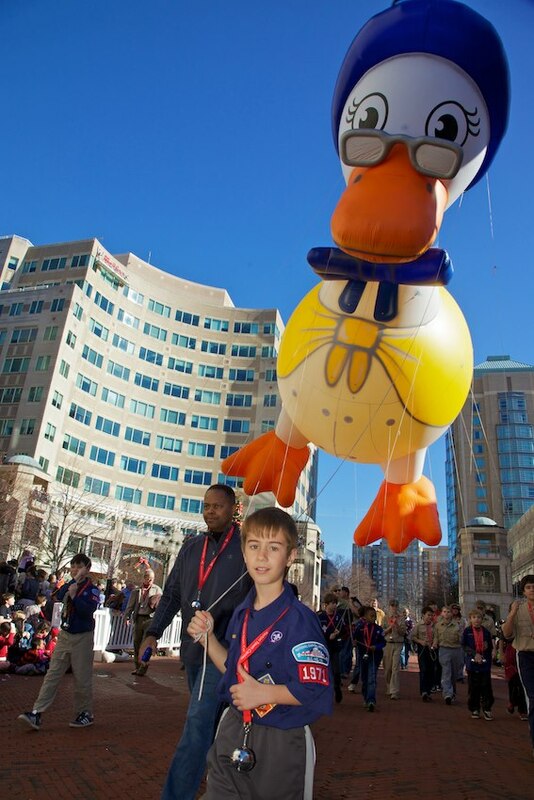 Reston Holiday Parade | Where Outside Is In! 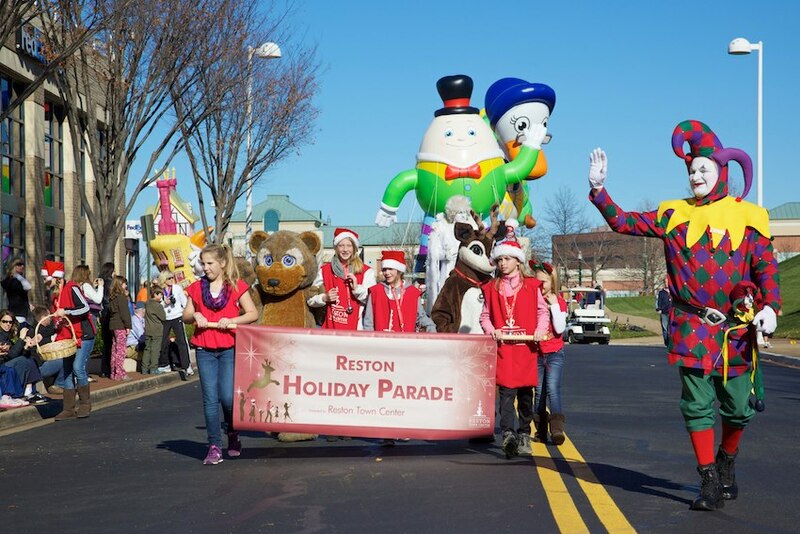 You are currently browsing the tag archive for the ‘Reston Holiday Parade’ tag. 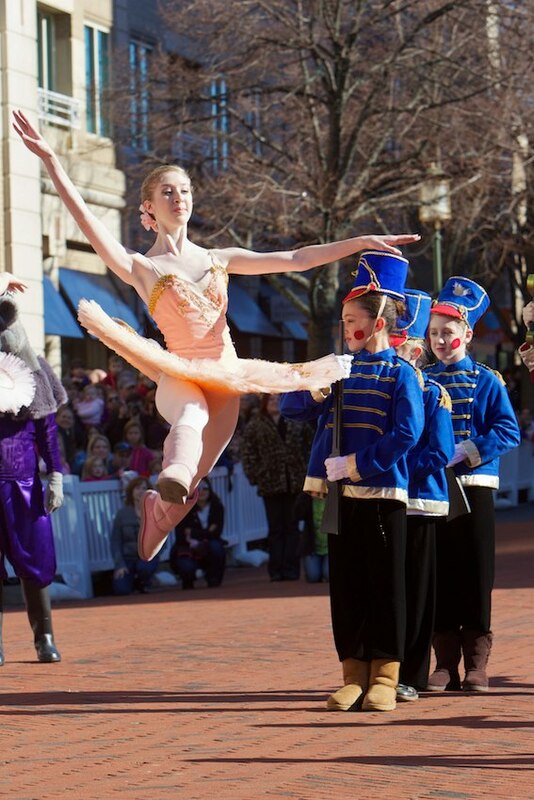 The Holidays are Here with the Reston Holiday Parade! 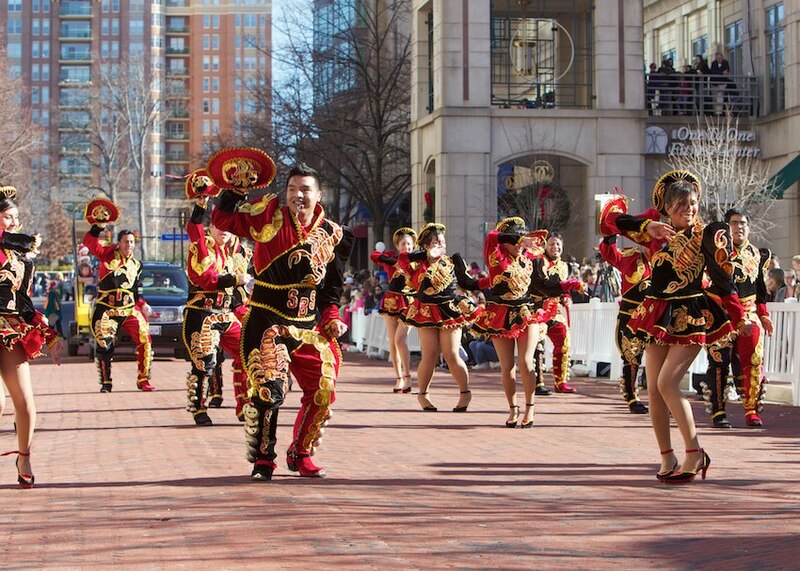 Some of the great things about the day after Thanksgiving: you have leftovers for days, you’re finally able to listen to Christmas music without earphones, but best of all, there’s a full day of activities going on at Reston Town Center! 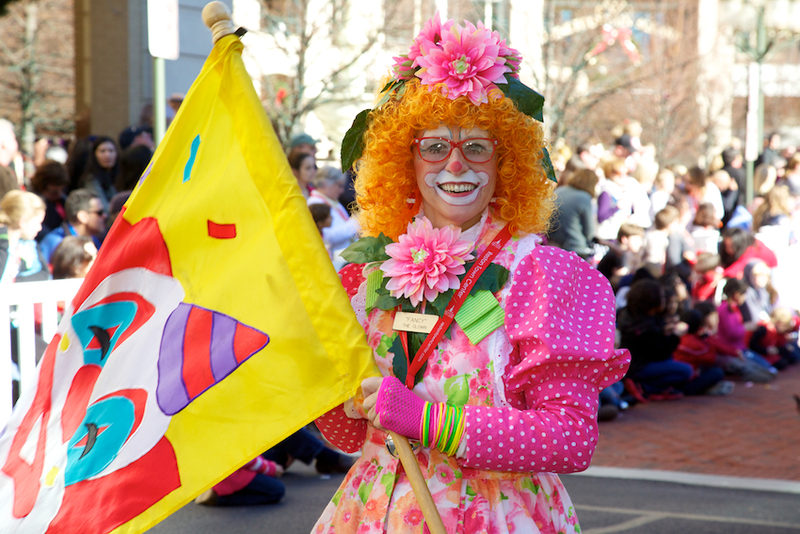 In case you’re not the type to get up at 3 am after eating all that food to go shopping (there will be plenty of time for that later), it’s time to “Come out to Play” with friends and family on Friday, November 23, featuring the Reston Holiday Parade at 11 am! Imagine standing next to a giant Christmas tree along Market Street (at an hour where the sun is out), cradling a warm cup of coffee or hot chocolate (depends on how grown up you feel that day), while you excitedly wait for the Emerald Society Pipe Band to signal the beginning of the parade as the opening banner makes its way down Market Street toward you. 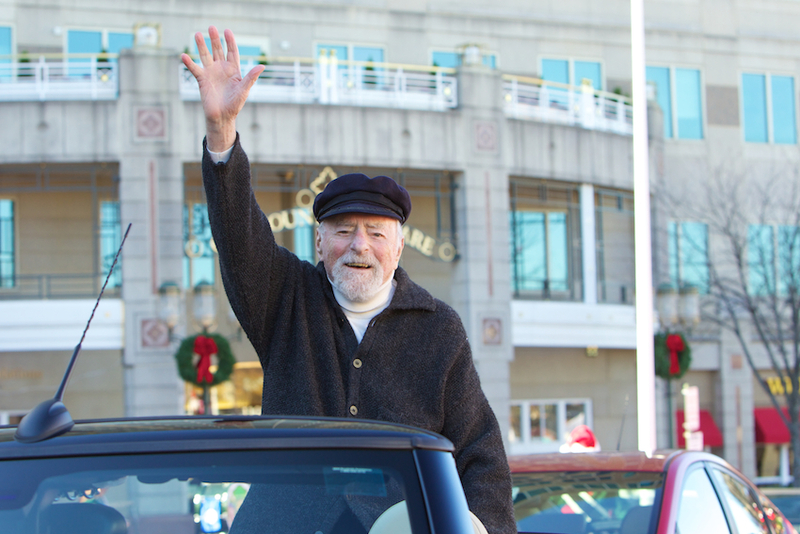 Pipes blaring, you cheer, clap, and join in with hundreds of children ringing their jingle bells as legendary creator of Reston, Bob Simon, rolls by. Dancers, musicians, acrobats, antique cars and more parade pass by while a few groups, like “Gotta Swing” and “Dynamix Salsa Dance Group” stop to really show off what they’ve got. There’s so much to see, but there’s no way you’ll miss those monstrous Macy’s-style helium balloons as they slowly float by, marveling in their wake. The line-up is different every year, but the nostalgia, camaraderie and merriment remain the same! So come out and see what spectacles await! And then FINALLY, after all the balloons, merriment and performances … Santa and Mrs. Claus, the ones we’ve been waiting for, come clip-clopping into view down the street in their horse-drawn carriage waving, and bringing the magic of the Christmas spirit with them. And as you feel that tingly emotion all over, you know, officially, Christmas has arrived and it really is the most wonderful time of the year! For more pictures of last year’s parade, check out our Facebook album! 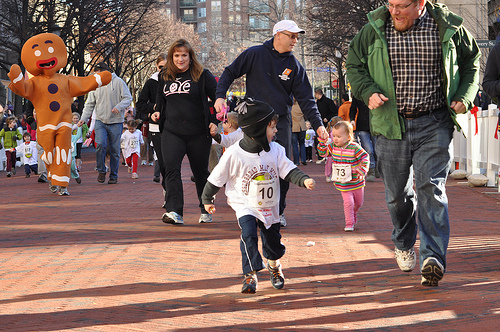 We also invite you to join the rest of our memorable day – with the Gingerbread Man Mile (for kids!) at 8am, Visits & Photos with Santa 12:30-4:30pm, Tree Lighting and Sing-Along at 6pm, Horse Drawn Carriage Rides 6:30-10pm. More information at www.restontowncenter.com/holidays! And for a little preview of what the day is going to look like, check out this news clip with Reggie the Bear! Whatever you do, we hope you and your family create a holiday season worth remembering for years to come! Get Ready for the Reston Holiday Parade! 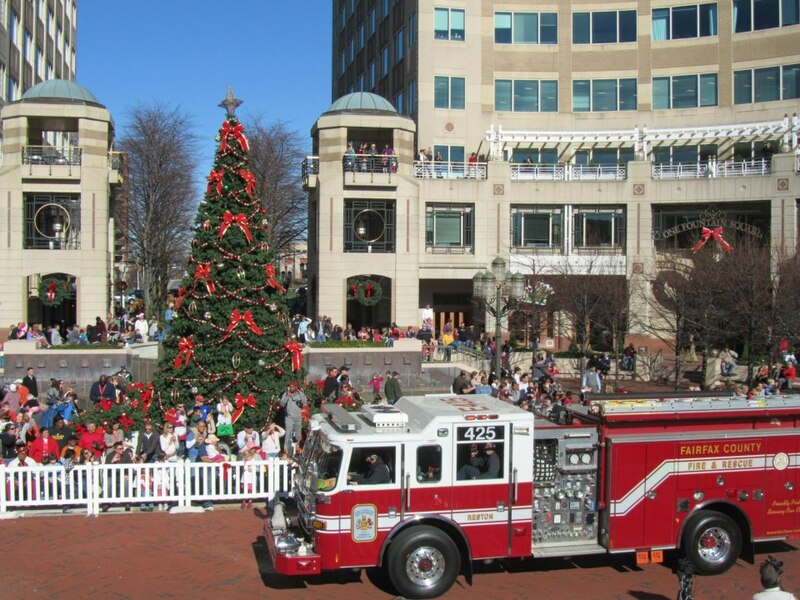 The holidays are coming to Reston Town Center on Friday, November 23! We’re pleased and excited to announce the 2012 theme “Come Out to Play!” celebrating the child in all of us with games of every shape and size – from board games and yard games, to card games and organized sports! We’re also delighted to honor Bruce Butler as this year’s Grand Marshal, he recently retired from South Lakes High School where he served as Assistant Principal for seven years and as an award-winning Principal for another seven! So join us for a playful day of holiday celebrations with activities, festivities and events for the whole family! We like to think of this day as “Parade day,” but it’s also Black Friday to the rest of the world, so stores open at 8 am instead of 10 am for those who want to do a bit of shopping while the kids are “running” around before the festivities. The day starts off bright and early at 8 am with the Gingerbread Man Mile fun run for kids ranging from toddlers to high schoolers. Presented by Potomac River Running, registration is free and all donations benefit Neediest Kids! There’s a reason to run as fast as you can; race winners get to take part in the parade following the race! The event we’ve been waiting for all year starts at 11 am sharp, so “Come Out to Play! ” – we had fun with the logo, hope you do too! 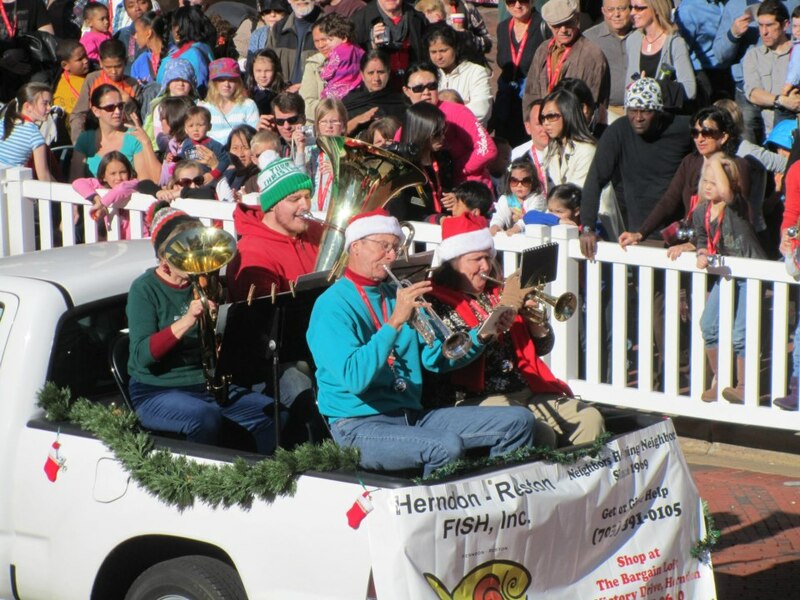 The parade has been a tradition since 1990 with Macy’s-style balloons, marching bands, dance numbers, cars, community groups and more, but most importantly it’s become a family tradition for many who join us year after year to watch the holidays come alive. And each year Santa and Ms. Claus are featured at the end of the parade, wishing everyone another memorable and joyous holiday season! So come out early for a good spot, and come dressed for any type of weather, as the show goes on no matter what! It wouldn’t be the Holiday Parade without the bells! Volunteers will be handing them out to children along Market Street prior to the start of the Parade so they can clap and jingle for the participants! Once the Parade has started, any remaining bells will be handed out near the fountain and Ice Skating Pavilion. Our goal is to make sure every child can receive a bell, thus, we strictly limit distribution to children. The 20 and up crowd, we understand your pain, we love the bells too, but we want to make sure the little ones have the most magical holidays and we appreciate your cooperation. 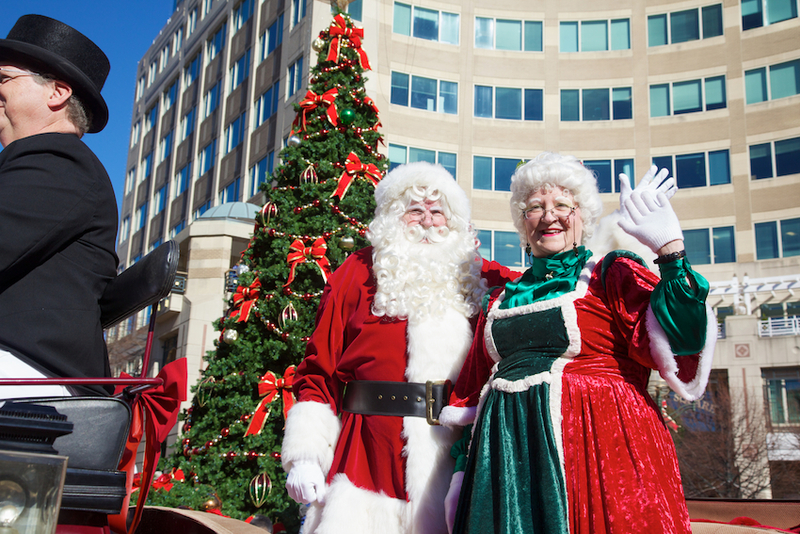 Once Santa and Mrs. Claus make their way over from the Parade, they will be available for visits and pictures from 12:30 – 4:30 pm by the information center. You can take home a 5” x 7” souvenir portrait when you donate any amount to South Lakes High School Chorus, who will be providing volunteers for the event! The day isn’t over yet, Santa and Mrs. Clause still have more work to do! At 6 pm a horse-drawn carriage will whisk the pair down Market Street to the giant Christmas Tree. 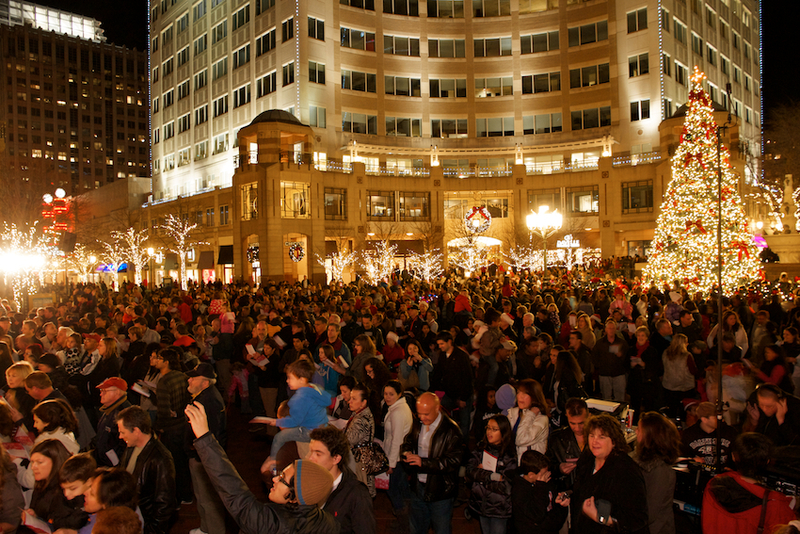 And as everyone gathers around, the whole crowd will close their eyes, count to three, and with a mighty wish, help Santa light up the tree and Reston Town Center for the holiday season! At that moment, Santa and Mrs. Claus, the Reston Chorale and a brass quintet will lead the merry bunch in Christmas carols and holiday melodies. Song books are provided before the tree lighting and after Santa heads back to the North Pole. The sounds of horse hooves clip clopping down Market Street and sleigh bells can only mean one thing … carriage rides! Starting at 6:30 pm, get picked up in front of Talbots on Market Street and enjoy a ride through the newly lit Reston Town Center. Rides cost $5 per person, (children 5 and under ride free!) with all proceeds benefiting Volunteer Fairfax, who also provides volunteers for the evening. But don’t worry if you can’t get a ride that night, carriage rides will also be available Saturdays in December, 4-9 pm benefiting different local non-profits. December 22, benefits Volunteer Fairfax! This special day wouldn’t be possible without the hundreds of faithful volunteers each year. So if you want to experience the holiday celebration from “inside,” email volunteer@restontowncenter.com for more information on volunteering! 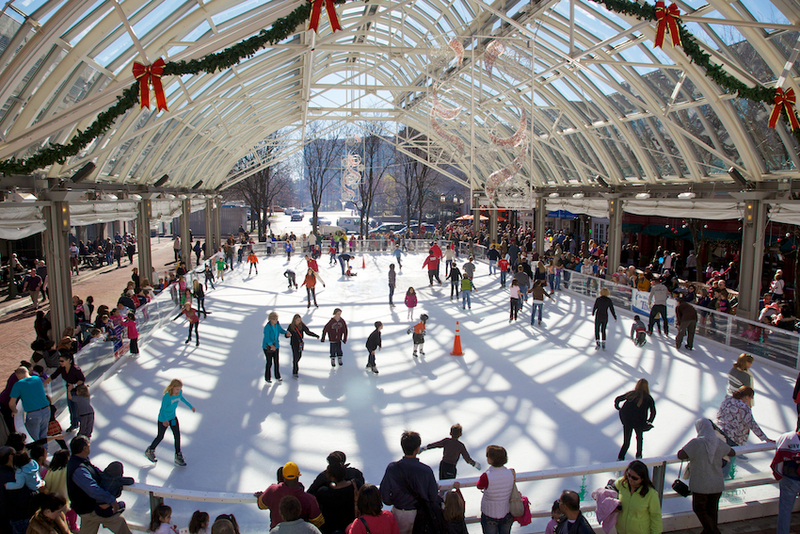 The sparkling ice skating rink will be open from 9 am – 11 pm for those whose holidays aren’t complete without some winter fun on the ice. Any skating supplies you may need are available in the Skate Shop next to the Pavilion. Don’t forget to visit the Gingerbread Village, a tradition as old as the Parade, on display in the Hyatt Regency Reston lobby from November 21 – December 27. Let the sweet aromas of gingerbread and candy take you back in time as you look through the intricate holiday village made completely of confection. The village takes five days to make and consists of 100 pounds of flour, 2 gallons of molasses, 2 gallons of honey, 145 pounds of sugar, 1 ½ pounds of cinnamon, 1 ½ pounds of nutmeg, 15 pounds of pretzels and 90 pounds of candy. So go and literally feast your eyes! We look forward to seeing you there, and if you’d like to see more pictures of last year’s festivities, check out our Facebook page! Yes, Snowmageddon has ended, and we are now in the midst of the great meltdown. We’re looking forward to Spring and Summer at Reston Town Center, and just wanted to remind you A) of all of the fun things coming your way with the warmer weather and B) of the many opportunities to volunteer and get involved in your community with us! Each year hundreds of local volunteers take Town Center by storm to enable the successful production of dozens of charitable and community events here. Nearly $2 million dollars were raised by non-profit events hosted at Town Center in 2009 alone! Check out this year’s lineup, and let us know if you’d like to volunteer by sending in this form! 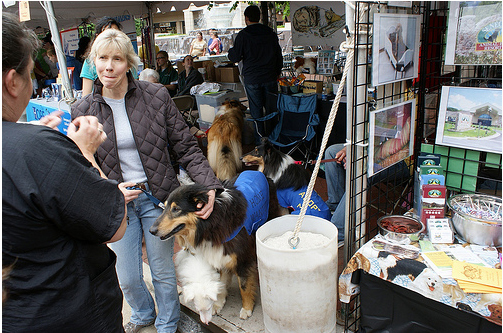 Pet Fiesta, coming May 1st 2010, is one of the many charity events coming to Town Center this year. Many volunteers are needed to make these events a success! 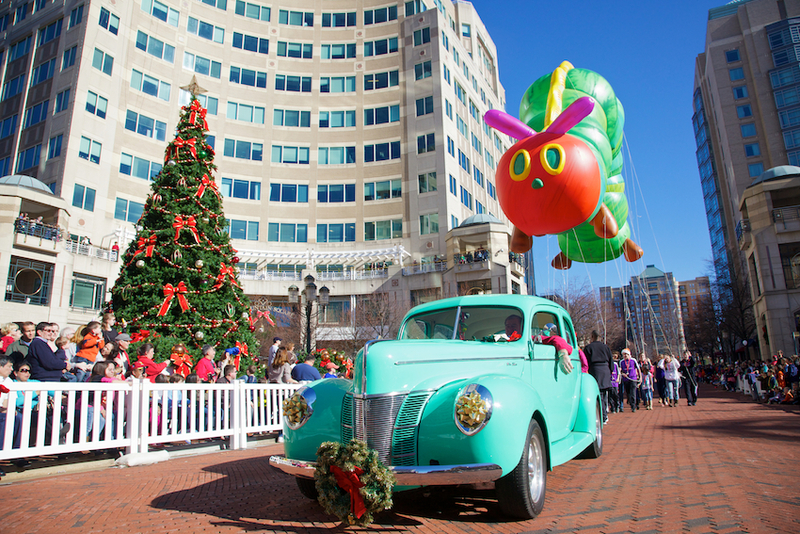 Reston Town Center presents the Reston Holiday Parade today beginning at 11:00 AM! 2009 marks the 19th year of the holiday parade, launching the festive season with Macy’s-style balloons, musical groups, dancers, antique cars, and more, in a one-of-a-kind, one-hour parade along Market Street! 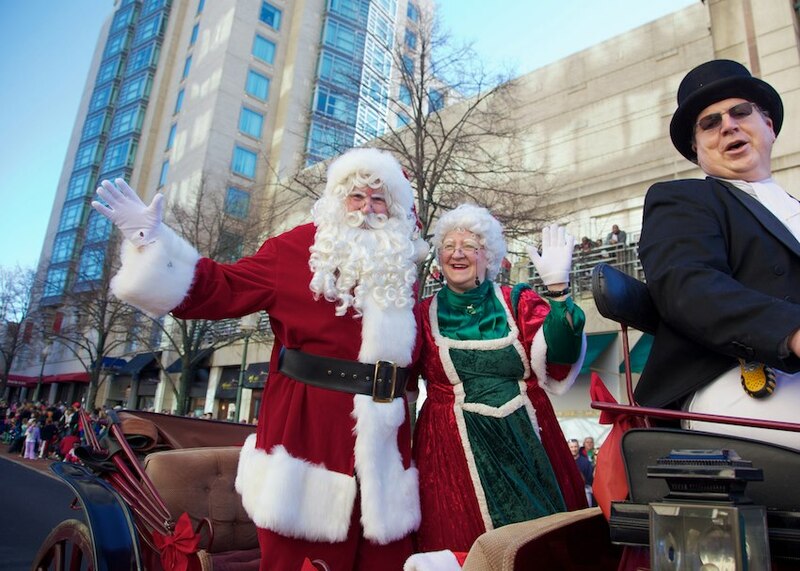 This year’s parade welcomes the arrival of Santa and Mrs. Claus in a horse-drawn carriage. The parade is on rain or shine – so come on out for a fun filled day! Schedule is listed below. Photos coming soon!